While grasses are not my favorite thing to paint (give me water anyday), I think these are doing what I wanted. The loopy-over ones (very technical term) interspersed with the straight angle-y ones seem to be doing the trick in creating a feeling of depth. I have used a variety of colors in the grasses. They may be hard to see but sap green, burnt sienna, yellow ochre, raw umber, naples yellow, paynes gray, and ultramarine blue are being used in all sorts of combinations. 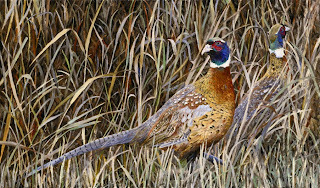 Here I have finished for now with the pheasants and am moving on to the grasses. With the amount of detail in the birds, the grasses need to have detail and structure also. (grasses are not one of my favorite things to paint.) These will be especially tricky. While I want the grasses to "read" well, they must not overpower the birds. A too confusing background will diminish the painting as a whole. A too loose background will end up with a painting that does not feel unified. You may not have time to read this today as you are preparing for your Groundhog celebrations. However, on this very special day as you are gathering with family and friends, I hope that not only will the day be all you had anticipated, but that it will also be a safe occasion for you. Too often we get carried away with the excitement of an event. Sometimes I have a hard time concealing my utter glee at a whole day devoted to an animal. Whether or not he sees his shadow, it is hard not to think of the joy felt by everyone on this occasion. 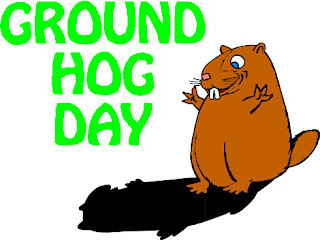 Have a Happy, Safe, and Fulfilling GroundHog Day!